ORDER by PHONE: You may order over the phone by Calling 1-352-688-8160 Monday to Friday between 10:30am and 5:00pm EST. 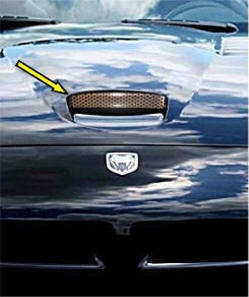 High Quality stainless steel perforated hood scoop grille. Designed to fit in to your hood's intake. High polished stainless steel looks like chrome but will not rust, corrode, or ever lose its luster. Easy to mount in minutes simply peel and stick. 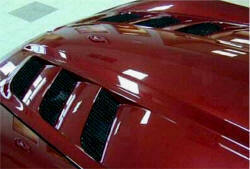 Can be removed later without damaging your hood paint. 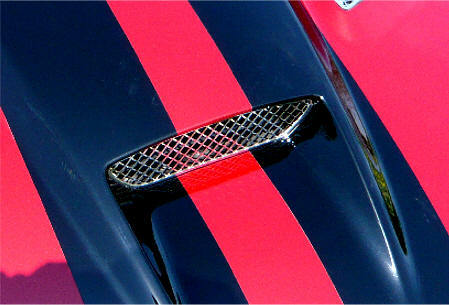 A big hit at car shows this grille gives a professional race car allure to your hood. Does not fit Viper SRT-10 2008. 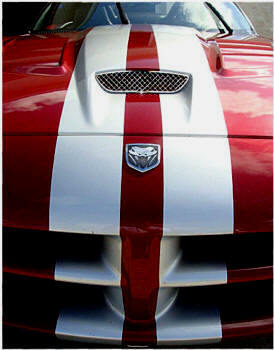 Super High Quality all Stainless Steel metal Rear Grilles give the appearance of the race car your Viper really is. Sturdy - Heavy duty all metal part. Easy to mount. 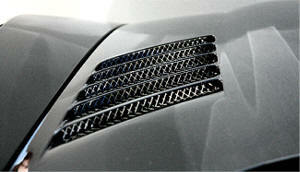 This product includes two Grilles one for each side. 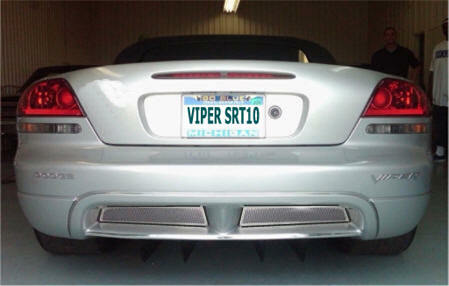 Does not fit the Viper SRT-10 Coupe. Does not fit the Viper SRT-10 Convertible. 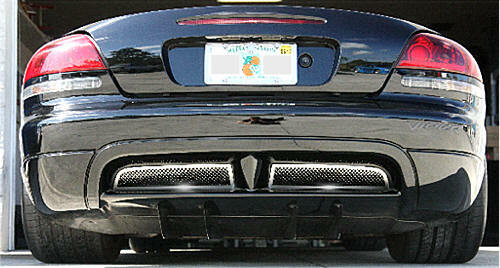 Chrome vinyl trim strip for your Viper Gen 3 rear valance really dresses up your rear end. "A jaw dropper"! 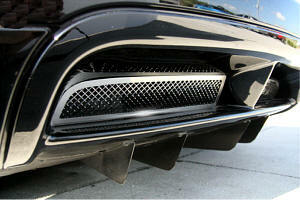 Gorgeous one piece rear grilles make your front intake sparkle! Gives it a professional race car look. Made of solid stainless steel and laser cut to a fine perfection. Will not rust, corrode, or ever lose it's luster. Easy peel and stick installation, no screws, no drilling or cutting. Parts can be removed and car will be stock again if you chose. 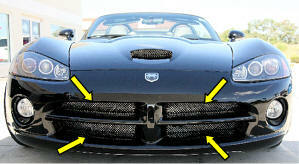 ACC-972040 Viper SRT/10 (2003-2010) Deluxe Front End Laser Mesh Grilles 4pc. Wow! It's a Jaw Dropper! "A jaw dropper"! 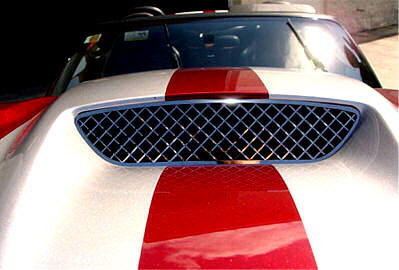 Gorgeous 4 piece front grilles make your front end sparkle! Gives it a professional race car look. Wow, what a difference. Note: Bottom grille Hood release handle is accommodated. 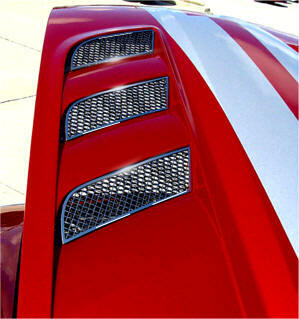 ACC-972042 Viper SRT/10 (2003-2006) Deluxe Laser Mesh Hood Grilles 10pc. Wow! It's a Jaw Dropper! "A jaw dropper"! 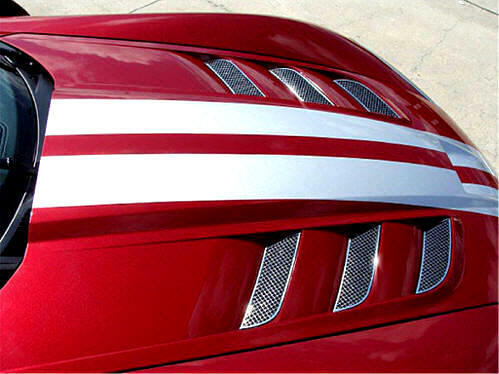 Gorgeous 10 piece (5 hood grilles per side) front grilles make your Hood sparkle! Gives it a professional race car look. Wow, what a difference. "A jaw dropper"! 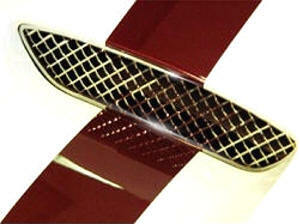 Gorgeous 2 piece rear grilles make your rear end sparkle! Gives it a professional race car look. It's a 'Jaw-Dropper' seeing it on your Snake!! Fits Convertible and Coupe. 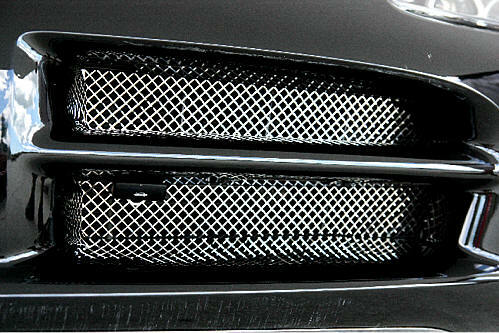 Extremely high quality all stainless steel laser cut hood vent grille set. 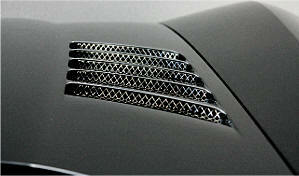 Includes six high polished grilles three for each side of the Hood. 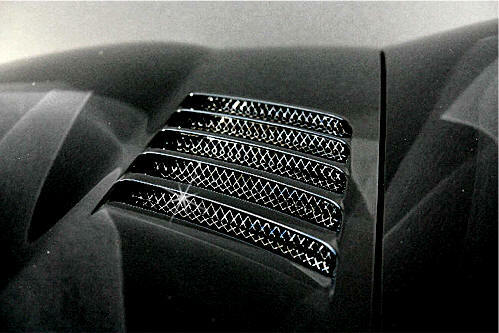 These grilles have a Highly polished mirror finish that will last forever. 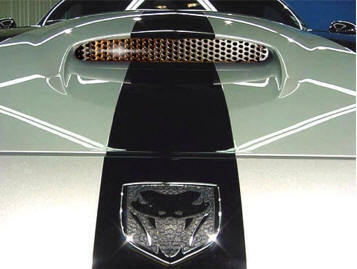 This is the most impressive thing you can do to the appearance of your Generation 4 Dodge Viper! What an amazing difference! This upgrade will knock your socks off. People at the car show were left with their jaws dropped at the stunning appearance of this deluxe upgrade. It is a gotta have for any Viper 2008-2010. 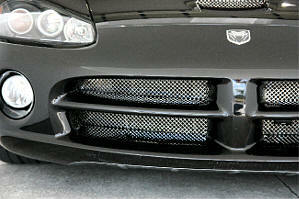 Easy mounting on top of the stock plastic grille with peel and stick and two fasteners per grille. Does not impede your airflow, will not rust or corrode. Stays on and will not come off during driving. 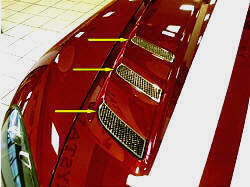 Can be removed without damaging or effecting your stock hood or grilles. Fits on top of stock grilles. You do not have to remove anything from your snake. 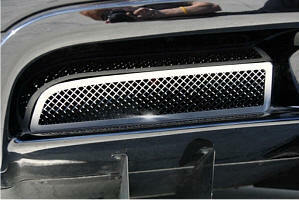 NOTE: We do sell the stock plastic grilles if you need them bottom of this page. A gorgeous upgrade - What a difference! 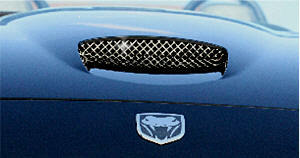 This deluxe center line hood scoop air intake grille matches the Hood Vent Laser Grille package above. 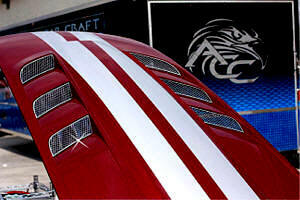 It can also be mounted alone to really brighten up your front hood. Made of high quality - high polished stainless steel with a mirror finish. A stunningly beautiful addition to your new Gen 4 snake. Easy mounting with peel and stick over your stock grille. Does not impede your airflow, will not rust or corrode. Stays on and will not come off during driving. 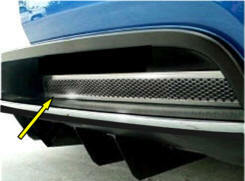 Can be removed without damaging or effecting your stock hood or grille. You do not have to remove anything from your snake.